More than the inspiration for the beloved film Field of Dreams, Shoeless Joe is a mythical novel about “dreams, magic, life, and what is quintessentially American” (Philadelphia Inquirer). “If you build it, he will come.” These mysterious words, spoken by an Iowa baseball announcer, inspire Ray Kinsella to carve a baseball diamond in his cornfield in honor of his hero, the baseball legend Shoeless Joe Jackson. What follows is both a rich, nostalgic look at one of our most cherished national pastimes and a remarkable story about fathers and sons, love and family, and the inimitable joy of finding your way home. Boston: Houghton Mifflin, 1982. Uncorrected Proof. 265 pp. 1 vols. 8vo. Gray printed wrappers; about fine. Uncorrected Proof. 265 pp. 1 vols. 8vo. Uncorrected proof of the Pulitzer Prize winning novel, later adapted to the screen as FIELD OF DREAMS. Boston: Houghton Mifflin. NF/NF. 1982. 1st Edition. Hardcover; 1st Printing. 1st edition/1st printing. SIGNED and INSCRIBED by the author on the half-title page: 'For Ed Morris With best wishes Bill Kinsella May 24/82 Chicago'. A blind-stamped (no color) embossment directly below that inscription reads 'Library of Edward L. Morris E.L.M. ', so the book's previous owner was the person the author's inscription was written to. Straight, clean, very tight book with only that blind-stamp ed embossment to keep it from being 'as new'. The price intact, crisp and clean dustjacket has just a touch of the lower spine end bluing to the green (much less than normal), and a couple of very tiny edge nicks at the flap fold ends, but is otherwise in excellent condition. A lovely copy of this classic which was made into the movie 'Field Of Dreams' and which won the Pulitzer Prize for Literature. A baseball-based fantasy about the power of dreams to move people. ; Signed by Author . Boston: Houghton Mifflin Company, 1982. 12/5/2009. Fine/Fine. First edition (a complete rewriting of the author's scarce 1980 Canadian issue *Shoeless Joe Comes to Iowa*). Fine in just about fine dustwrapper with rubbing and tiny tears at the foot. Inscribed by Kinsella. Basis for the classic Hollywood fantasy *Field of Dreams*, with Kevin Costner and James Earl Jones, which quickly achieved a cult following and has turned more than one Iowa cornfield into a popular tourist attraction. *McCue* p.60, *Shannon 100*. BOSTON: HOUGHTON,MIFFLIN CO.. Near Fine. 1982. First Edition. UNCORRECTED PROOF. Near fine in plain grey printed wrappers. (Light corner crease on front cover & corner crease at upper lefthand corner of rear cover) Basis for the popular film. .
Boston: Houghton, 1982. Cloth and boards. Fine in like dust jacket. First (U.S.) edition of the author's first novel, a HMCO Fellowship winner and the source for the popular film, FIELD OF DREAMS. 1982-03-05. New. Ships with Tracking Number! INTERNATIONAL WORLDWIDE Shipping available. Buy with confidence, excellent customer service! Boston: Houghton, Mifflin, 1982. First Edition. Fine in dust jacket. Warmly inscribed by the author in 1985 to the future President of Dartmouth College. Condition: First Edition. Fine in dust jacket. Warmly inscribed by the author in 1985 to the future President of Dartmouth College. BOSTON: HOUGHTON, MIFFLIN & COMPANY.. Fine. 1982. First Edition. 039532047X . About fine in a fine dj. (Couple of tiny specks of foxing at top edge. 1/2'-inch wrinkle at mid-spine on dj.) A Houghton, Mifflin Literary Fellowship Award winner, and basis for the beloved film adaptation starring Kevin Costner. Sharp copy. .
Boston: Houghton Mifflin. Fine. 1982. First Edition. Softcover. Beige printed wraps. Uncorrected proof. Flat signed by Kinsella to the title page. Fine condition in clear plastic cover in like condition. Appears unread. ; 8vo 8" - 9" tall; 265 pages; Signed by Author . 1983-02-06. New. Ships with Tracking Number! INTERNATIONAL WORLDWIDE Shipping available. Buy with confidence, excellent customer service! Boston: Houghton Mifflin, 1982. Very good hard cover and dust jacket. First edition. 1982. Signed by author . Signed. First Edition. Hard Cover. Very Good/Very Good. Boston, Massachusetts: Houghton Mifflin Company, 1982. Winner of a Houghton Mifflin Literary Fellowship Award. 265 pages. Dark green endpapers. Quarter cream cloth with grey paper covered boards; gilt design on front cover; gilt titles on spine. Colour pictorial DJ; price-clipped. FINE/VG+.. Hard Cover. Fine/Very Good+. Wilmington, Massachusetts, U.S.A.: Houghton Mifflin, 1982. (1st) Winner of Houghton Mifflin Literary Fellowship Award. Slightly smaller book, cream cloth spine, smooth dark green boards with gilt illustration of baseball player, gilt lettering bright on spine, dark gray inside covers and adjacent end papers, 265 pages. DJ designed by Wendell Minor. DJ glossy beneath mylar with color-illustration of farm on front, spine and back, an image of a baseball players in sky above. DJ has praise on back from Jim Murray and George Plimpton. DJ has light wear to bottom tips, microtear at top front edge and spine top edge, very slight wear at spine bottom left edge, 3/8" tear with very slight wear at top back edge, two very tiny tears at bottom back edge. Near Very Good DJ/Very Fine book.. First Edition. Hard Cover. Fine/Near Very Good. Illus. by Minor, Wendell. Houghton Mifflin (T), 1982-04-01. Hardcover . LikeNew/Very Good. Signed by author "Best Wishes" on half-title page. (Not inscribed TO any particular name, just best wishes.) First printing with 1 in number line. DJ price of $11.95 intact. Minor crease to bottom 1/4" of rear panel of DJ with associated closed tear. Near fine jacket. Boston: Houghton Mifflin Company, 1982. First Edition. Hardcover. Fine in a Fine dustwrapper with a tiny nick. Made into a memorable film, FIELD OF DREAMS, starring Kevin Costner and James Earl Jones. Boston: Houghton Mifflin, 1982. Cloth and boards. First edition of the author's first novel, the source for the popular film, FIELD OF DREAMS. Fine in near fine dust jacket with a few small nicks along the top edge. New York, NY, U.S.A.: Houghton Mifflin Company, 1982. A beautiful copy of the first U.S. edition of this popular baseball novel by Kinsella. Uncommon in this protected condition. Winner of the Houghton Mifflin Literary Fellowship Award. Three book reviews and original receipt laid in. . First Edition. Hard Cover. Fine/Fine. Wilmington, Massachusetts, U.S.A.: Houghton Mifflin, 1982 Signed bookplate by Kinsella laid in. Edgewear, discoloration, creasing and closed tears to dust jacket. Slight slant to spine and soiling to page edges. Very Good+/Very Good+.. Signed by Author(s). 1st Edition. Hardcover. Very Good/Very Good. Boston: Houghton-Mifflin Company, 1982 Original dark grey paper boards backed in beige cloth. Signed, "Bill Kinsella" on title. Four tiny, nearly imperceptible repaired tears to DJ. No other damage or writing. Squeaky clean from Ray's homestead on the front to the empty bleachers on the back. "A warm-hearted, hilarious, outrageous novel about the power of dreams to move people, to make them come alive again." - DJ. Winner of the Houghton-Mifflin Literary Fellowship Award. Number line ends in 1. 265 pp.. Signed by Author. First Edition. Hard Cover. Near Fine/Good Plus to Very Good. 8vo - over 7¾" - 9¾" tall. VIRGIN BOOKS. Hardcover. 0850319110 New Condition. . New. VIRGIN BOOKS. Hardcover. 0850319110 Like New Condition. . Fine. Boston. 1982. Houghton Mifflin. 1st Printing. Very Good In Dustjacket. ISBN:039532047x. 265 pages. hardcover. Jacket design by Wendell Minor. FROM THE PUBLISHER - SHOELESS JOE, winner of the Houghton Muffin Literary Fellowship Award, is a warm-hearted, hilarious, outrageous novel about the power of dreams to move people, to make them come alive again. The narrator and protagonist, Ray Kinsella, an Iowa insurance agent turned farmer, is a charming combination of dreamer, clown, and hero. His love of baseball is symbolic of peoples love for any ritual that enchants them, gives their lives a sense of wonder and delight. One summer evening, while sitting on his porch, Ray hears the disembodied voice of a baseball announcer saying, If you build it, he will come. He, Ray somehow knows, is Shoeless Joe Jackson, his hero, who was thrown out of professional baseball as a result of the 1919 Black Sox scandal. It is a baseball stadium, to be built in Rays cornfield. He builds the stadium and anxiously awaits Shoeless Joes appearance. But Rays adventures have just begun. Next, the voice tells him to ease his pain, and he knows the pain is that of J. D. Salinger, the famous reclusive author. Ray discovers that Salinger is a baseball fan and realizes that his mission is to kidnap Salinger and take him to a baseball game at Fenway Park in Boston. Ray heads east and, after a series of outlandish encounters, he returns to his cornfield stadium with a motley crew of fellow-dreamers. There, under the glow of the lights, each of them works out his redemption through the magic of love and baseball. inventory #5056 ISBN: 039532047x. Boston: Houghton, Mifflin and Company.. Fine in Near Fine dust jacket. 1982. First Edition; First Printing. Hardcover. 039532047X . First edition. Fine in near fine dust jacket. (Small chip at base of spine on jacket. Couple short edge tears. Hint of faint shelf-soiling on rear panel. ) A Houghton, Mifflin Literary Fellowship Award Novel. Basis for the popular film film adaptation. ; 8vo 8" - 9" tall; 265 pages . Boston: Houghton, 1982. Cloth and boards. First edition of the author's first novel, the source for the popular film, FIELD OF DREAMS. Fine in near fine dust jacket with a small snag at top edge of rear panel, and a bit of wear and small tear at the toe of the spine. Houghton Mifflin, 1982. Book. Fine. Original Wraps. First Edition. 8vo - over 7¾" - 9¾" tall. Rare Uncorrected Proof of This Houghton Mifflin Fellowship Award Winner. First Edition in Printed Wraps. Great Baseball Movie. Beautiful Copy..
HOUGHTON, MIFFLIN CO. BOSTON 1982. Fine. 1982. First Edition. Hardcover. 039532047X . Close to fine in a Nf. dj. (Previous owner's name inked on front pastedown. A few 1/2" tears on rear panel. A couple of small soil spots on rear panel. Traces of light rubbing to dj.) Winner of the Houghton, Mifflin Literary Fellowship award & basis for the hit film. .
Boston: Houghton Mifflin, 1982. Uncorrected Proof. Paperback. Paperback. Uncorrected Proof. A fine copy in plain gray wraps. This is an early an uncommon state of he Canadian author's mystical baseball novel. It was the basis for the movie Field of Dreams that starred Kevin Costner and James Earl Jones. 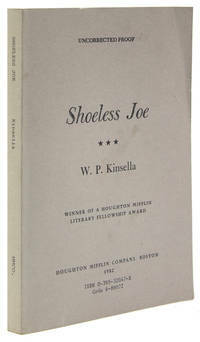 KINSELLA, W. P. SHOELESS JOE [A Novel]. Winner of a Houghton Mifflin Literary Fellowship Award. Boston:: Houghton Mifflin Company,, 1982. First edition, proof copy; uncorrected proof copy (stating 'Uncorrected Proof' on front cover). . Faint crease on front cover, else a near fine copy. . Octavo, dark grey printed wrappers (stating 'Uncorrected Proof' on front cover), 265 pages. Condition: Faint crease on front cover, else a near fine copy. Boston: Houghton Mifflin Company, 1982. First U.S. Edition. Hardcover. Near Fine/Near Fine. First US edition of this now revered novel about baseball, among other things. Lovely near fine copy with minor crimping to spine ends in near fine unclipped jacket. Nice copy of a classic. Seller: Derringer Books, Member A.B.A.A. Boston: Houghton Mifflin, 1982. First. hardcover. fine/near fine. 8vo, cloth backed boards, d.w. Boston:L Houghton Mifflin, 1982. First Edition. Houghton Mifflin Literary Fellowship Award novel, and the basis for a film. Short closed tear on top edge of the dust wrapper, otherwise fine. Boston: HMCo, 1982. Proof. softcover. Very good. Boston: HMCo, 1982. Uncorrected proof. Printed wrappers. Softcover. A crease to the front cover and the first few pages, minor wear to the front cover. Very good. The movie FIELD OF DREAMS based on this book. BOSTON: HOUGHTON MIFFLIN CO. NF/VG+. PUB 1982. FIRST EDITION. BOOK HAS SOME SCATTERED SOILING TO THE TEXT EDGES BUT IS OTHERWISEFINE. D.J. HAS A SMALL BIT OF WEAR AT THE CORNERS AND SPINE-ENDS WITH ALIGHT CREASE THE LENGHT OF THE SPINE PANEL, A ONE INCH TEAR WITHASSOCIATED CREASE AT THE TOP OF THE REAR PANEL, AND PRICE-CLIPPED. AVERY NICE COPY.. Keywords: BASEBALL, NOVEL, INVISIBLE, ABCDEF. Boston: Houghton-Mifflin Company, 1982. First Edition. Hardcover. Near fine/very good +. 265 p. 21 cm. Cream spine with paper covered boards. In mylar-covered pictorial dustjacket. Signed by author on front endpaper. In dustjacket with a few tiny tears to edges. Top edge of text block speckled. Boston: Houghton Mifflin. Very Good in Very Good dust jacket; Gray hardcover with copper baseball . player decoration and one quarter white cloth spine with copper titles, . bottom corners lightly bumped; dust jacket, now in mylar, has small edge . creases and wear, very small spot on top edge; bright and clean text pages . with light edge soiling.. 1982. First Edition; 1st Printing. Hardcover. 039532047X . This Houghton Mifflin Literary Fellowship Award winning novel was the basis for the successful film, Field of Dreams. ; 8vo 8" - 9" tall; 265 pages . Boston: Houghton Mifflin, 1982. First edition. Houghton Mifflin Literary Fellowship Award winner and basis for the hit movie "Field of Dreams." Uncorrected proof, very good in gray, printed paperwraps with lower corner nicked, spine slightly sunned and light soiling to rear cover. 1996-07-03. New. Ships with Tracking Number! INTERNATIONAL WORLDWIDE Shipping available. Buy with confidence, excellent customer service! London, United Kingdom: Allison & Busby, 1988. Green cloth, illus dj, very slight rub to top of dj, page edges beginning to tan. 1st UK edition, the story that became the kevin kostner film field of dreams. 1st Edition 1st Printing. Hard Back. Very Good/Very Good. 140x210mm. 1988-05-19. Good. Ships with Tracking Number! INTERNATIONAL WORLDWIDE Shipping available. May not contain Access Codes or Supplements. May be ex-library. Shipping & Handling by region. Buy with confidence, excellent customer service! Boston: Houghton Mifflin Co., 1982. VG/VG , Hardcover First Edition some chipping to edges of DJ . First Edition. Hard Cover. Very Good/Very Good. 1991-06-01. Good. Ships with Tracking Number! INTERNATIONAL WORLDWIDE Shipping available. May not contain Access Codes or Supplements. May be ex-library. Shipping & Handling by region. Buy with confidence, excellent customer service! Boston: Houghton Mifflin, 1982. First U.S. edition.Very near fine in a NF DJ, with a 1/2" closed tear. Filmed as A FIELD OF DREAMS, with Kevin Costner.Houghton Mifflin Literary Fellowship Award winner.. First Edition. Hard Cover. Very Near Fine/Near Fine.